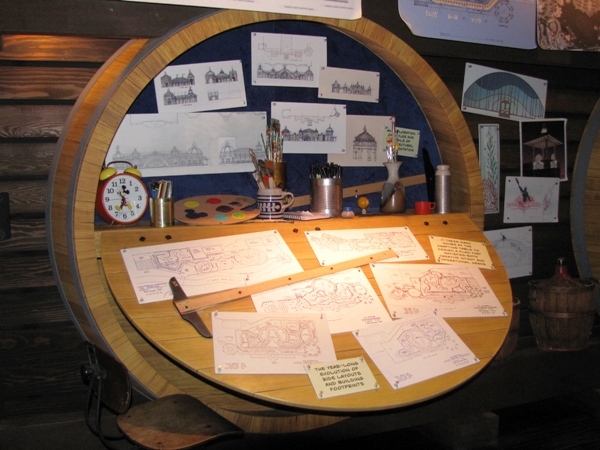 I love stopping by the Blue Sky Cellar at Disney California Adventure to see what’s new and check out some of the Imagineering secrets. 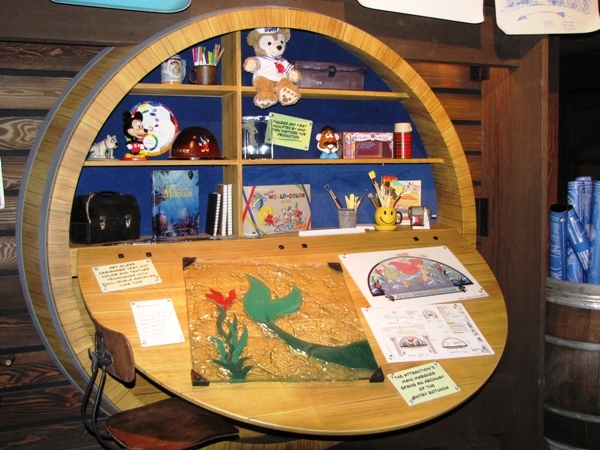 For the last few months the Cellar has been displaying some exhibits on the design and creation of the newest attraction The Little Mermaid – Ariel’s Undersea Adventure. For those who didn’t see this display, here are a few pictures. 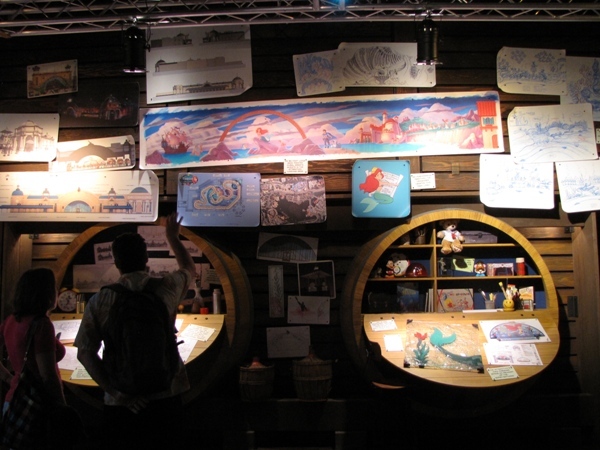 The Blue Sky Cellar has several display areas. Drawings, artist conceptions, test prints and floor plans cover one whole wall. 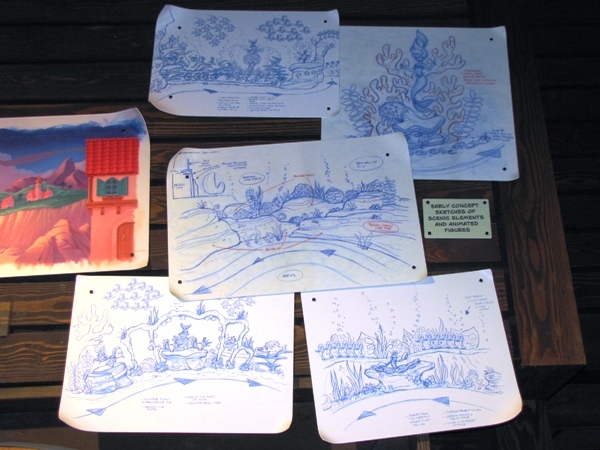 A mock up drawing station shows sketches of several versions of the track layout at Ariel’s Undersea Adventure. 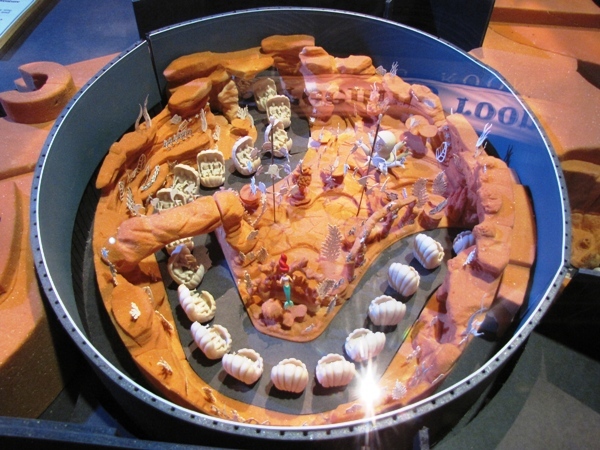 You can get an idea of how the attraction and storyline evolved. Even the direction of the ride vehicles through the building changed. At this station they showed tests of colors and designs as they would appear on art glass. This would later be used on the main marquee at the attraction’s entrance. Here are some “early concept sketches of scenic elements and animated figures.” I love the notations and suggestions that appear on the drawings. 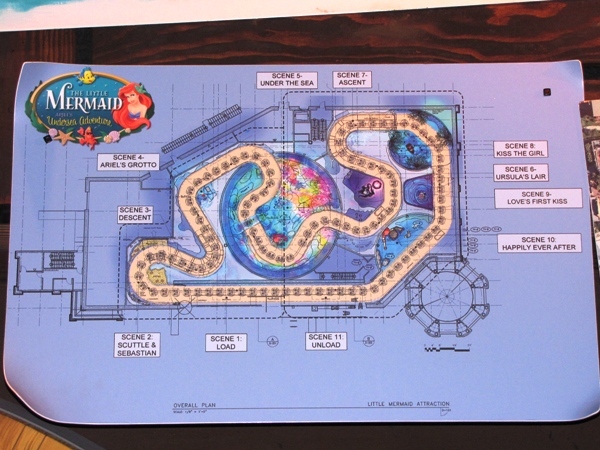 Here is the full final track layout for The Little Mermaid. You see the progression of the clamshell vehicles from scene to scene and also how each vehicle is facing in each area. It’s fun to see this overhead view, because when you are riding the attraction there is so much to look at that you aren’t aware of the turns as you go through the show building. Across the room is a small model of the full attraction. 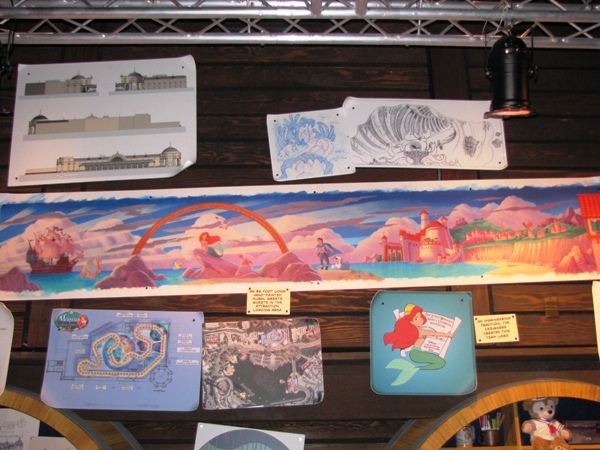 Here you can see the “Under the Sea” celebration room and representations of many of the elements that were eventually used. 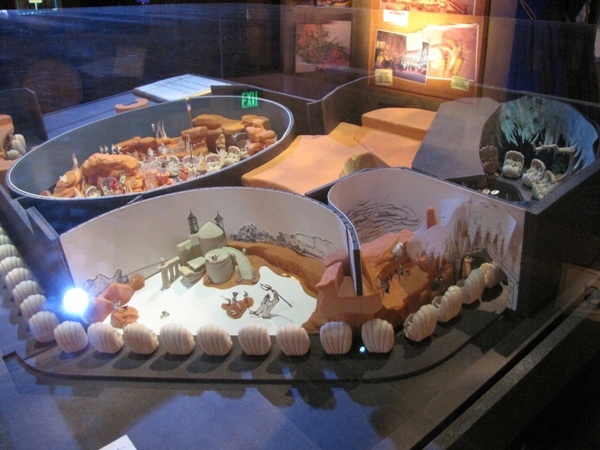 Here is another look at the model showing the concept of the finale room. This is very bare in this model and would be filled with many characters and special effects in the finished version. On the side wall are some of the new attraction posters for the Little Mermaid and several other attractions at California Adventure. 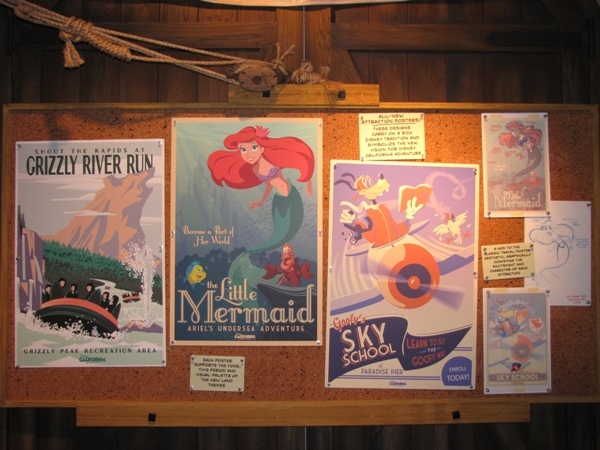 These posters are reminiscent of the classic attractions posters that you find throughout the Disneyland Resort. 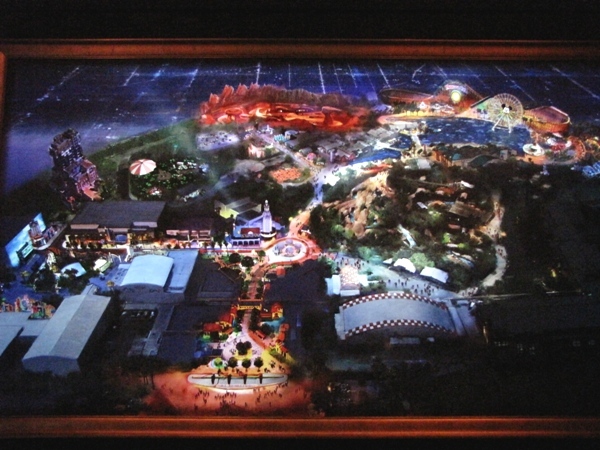 On the far side of the Blue Sky Cellar’s presentation area, Imagineers have replaced the large map of the new California Adventure with a high tech, high definition display screen which shows all the new areas and attractions. Can’t wait until it’s finished! 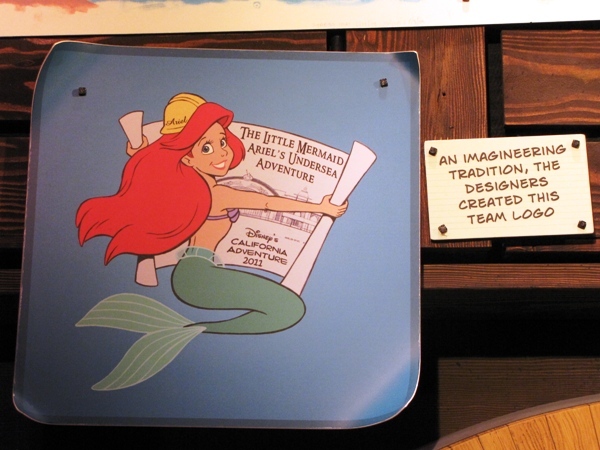 Ariel’s Undersea Adventure is now open. Click to see more about the attraction or the opening ceremonies. Soon the exhibits at the Blue Sky Cellar will be changing. Can’t wait to see what’s next!